DVD Audio DTS 5.1. Internationally renowned Japanese composer Kitaro has, since the early 1970s, consistently created music to help people connect with the Earth and to feel the surrounding Universe. Influenced by his reverence for and appreciation of nature, the multiple Grammy-winner creates music that conjures up images of humanity's habitat, incorporating the sounds of waves, wind, and rain into his compositions. Kitaro's soundtrack for the long-running and popular Japanese documentary series "SILK ROAD, " about the ancient trade route linking Europe to China, seamlessly blends influences from both Eastern and Western sources. It quickly came to be regarded as a masterpiece. By turns majestic and tranquil, lush and charmingly simple, the soundtrack has garnered Kitaro a devoted worldwide following, and has provided inspiration and healing for many. This selection features a previously unreleased version of the "Theme from Silk Road, " and "Pray at Xian/ Mercury, " which was recorded live in China during Kitaro's 2002 Silk Road Tour. Other tracks include "Linden, " "Taklamakan Desert, " and Moon-Star. , Partially recorded in Xian, China in 2002. 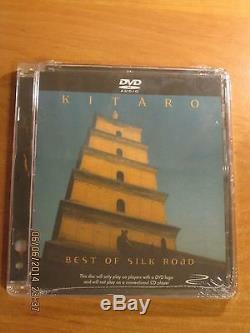 The item "KITARO BEST OF SILK ROAD 5.1 DVD-Audio DTS Sealed" is in sale since Sunday, November 11, 2018. This item is in the category "Music\CDs". The seller is "bracket40" and is located in Trzebiatów n Rega. This item can be shipped worldwide.